Teamup offers a unique calendar access permission type that allows the user to be able to modify his or her events but not those of others on the calendar. The permission is called modify-from-same-link. We’d like to share a use case where this unique permission makes Teamup a perfect solution for a real-world need. 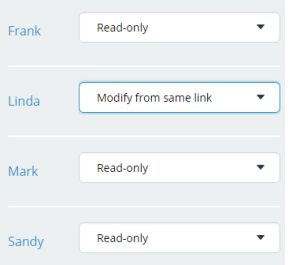 Click “Create new link”, give a name (e.g. Linda), leave the permission “modify” as is at this point, click “Save”. Click “Edit” right next to the newly created link, the Edit Link page appears. Scroll down, select “Share selected calendars”. Select “Modify-from-same-link” for the sub-calendar of concern, e.g. Linda, and select “Read-only” for all the other sub-calendars. Save and exit the Edit Link screen. After you have created this link, share it with Linda. When Linda opens the calendar, all existing events on this calendar have the small lock sign, meaning they can not be edited. But Linda will be able to edit any events she created with her link. It is then also possible to see which link/user created and last modified the event. This information can be seen when viewing a read only version of an event as explained here.